In my view, one of the most underreported stories coming out of Omaha the last 50 years was what Don Benning achieved as a young black man at the University of Nebraska at Omaha. At a time and in a place when blacks were denied opportunity, he was given a chance as an educator and a coach and he made the most of the situation. The following story, a version of which appeared in a March 2010 issue of The Reader (www.thereader.com), charted his accomplishments on the 40th anniversary of making some history that has not gotten the attention it deserves. He made history at then-Omaha University as the nation’s first black coach of a major team sport at a predominantly white institution of higher education. I believe he was also the first black coach to lead a team at a predominantly white high education institution to a national championship. He laid the groundwork for the UNO wrestling dynasty that followed some years later under the leadership of Mike Denney, who always credited Don with getting the whole thing started. 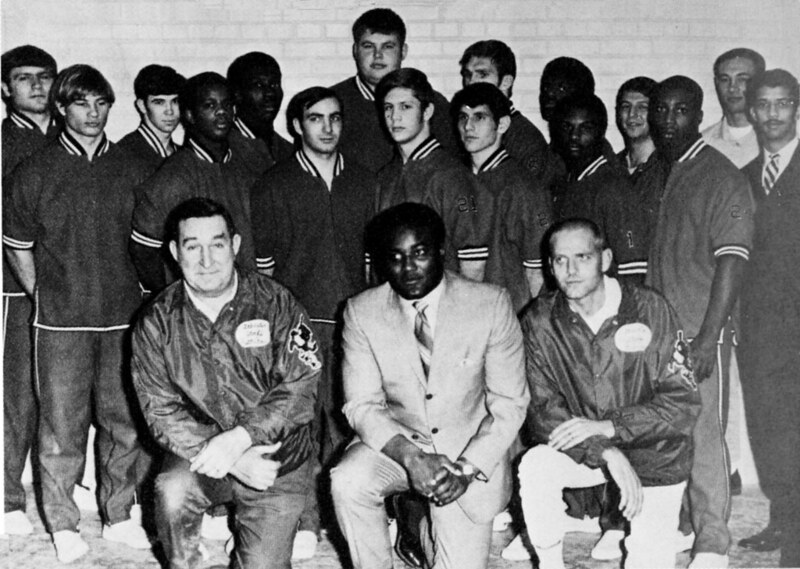 In leading his team to the 1970 NAIA national title, when they roundly beat teams from from larger schools, he gathered around him a diverse group of student-athletes at a time when this was not the norm. A team coached by a young black man and comprised of whites, blacks and Latinos traveled to some inhospitable places where race baiting occured but he and his student-athletes never lost their cool. They let their actions speak for them. One of the pleasures in doing this story was getting to know Don Benning, a man of high character who took me into his confidence. I shall always be grateful. Host UNO has been a dominant fixture on the D-II wrestling scene for decades. Its No. 1-ranked team is the defending national champs and is expected to finish on top again under Mike Denney, the coach for five of UNO’s six national wrestling titles. The first came 40 years ago amid currents of change. Every dynasty has a beginning and a narrative. UNO’s is rooted in historic firsts that intersect racial-social-political happenings. The events helped give a school with little going for it much-needed cachet and established a tradition of excellence unbroken now since the mid-1960s. It all began with then-Omaha University president Milo Bail hiring the school’s first African-American associate professor, Don Benning. The UNO grad had competed in football and wrestling for the OU Indians and was an assistant football coach there when Bail selected him to lead the fledgling wrestling program in 1963. The hire made Benning the first black head coach of a varsity sport (in the modern era) at a predominantly white college or university in America. It was a bold move for a nondescript, white-bread, then-municipal university in a racially divided city not known for progressive stances. It was especially audacious given that Benning was but 26 and had never held a head coaching position before. Ebony Magazine celebrated the achievement in a March 1964 spread headlined, “Coach Cracks Color Barrier.” Benning had been on the job only a year. 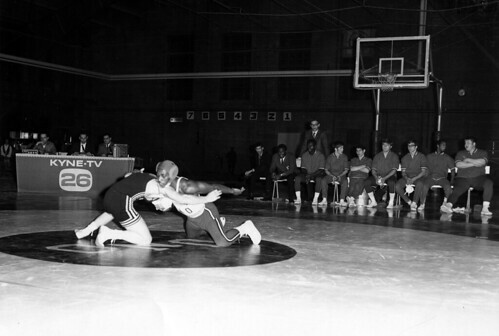 By 1970 he led UNO to its first wrestling national title. He developed a powerful program in part by recruiting top black wrestlers. None ever had a black coach before. Indeed, a few years after Benning’s arrival, UNO became the site of more black inroads. The first of these sawMarlin Briscoe star at quarterback there, which overturned the myth blacks could not master the cerebral position. Briscoe went on to be the first black starting QB in the NFL. Benning said he played a hand in persuading UNO football coach Al Caniglia to start Briscoe. Benning publicly supported efforts to create a black studies program at UNO at a time when black history and culture were marginalized. The campaign succeeded. UNO established one of the nation’s first departments of Black Studies. It continues today. Once given his opportunity, Benning capitalized on it. From 1966 to 1971 his racially and ethnically diverse teams went 65-6-4 in duals, developing a reputation for taking on all comers and holding their own. Five of his wrestlers won a combined eight individual national championships. A dozen earned All-America status. That championship season one of Benning’s two graduate assistant coaches was fellow African-American Curlee Alexander. The Omaha native was a four-time All-American and one-time national champ under Benning. He went on to be one of the winningest wrestling coaches in Nebraska prep history at Tech and North. Bernie Hospokda, Dennis Cozad, Rich Emsick, products of south Omaha’s Eastern European enclaves. Half the starters were recent high school grads and half nontraditional students in their 20s; some, married with kids. Everyone worked a job. If there was one thing beyond wrestling they shared in common, said Hospodka, it was coming from hardscrabble backgrounds. “Some of the kids came from situations where you had to be pretty tough to survive,” said Benning, who came up that way himself in a North O neighborhood where his was the only black family. Dhafir was the team’s acknowledged leader. Mel also a standout football lineman, wasn’t far behind. Benning said Dhafir’s teammates would “follow him to the end of the Earth.” “If he said we’re all running a mile, we all ran a mile,” said Hospodka. Having a strong black man as coach meant the world to Mel and Dhafir. “Something I always wanted to do was wrestle for a black coach. It was about time for me to wrestle for my own race,” said Mel. The brothers had seen the Ebony profile on Benning, whom they regarded as “a living legend” before they ever got to UNO. Hospodka said Benning’s race was never an issue with him or other whites on the team. Mel and Dhafir set the unrelenting pace in the tiny, cramped wrestling room that Benning sealed to create sauna-like conditions. Practicing in rubber suits disallowed today Hospodka said a thermostat once recorded the temperature inside at 110 degrees and climbing. Guys struggled for air. The intense workouts tested physical and mental toughness. Endurance. Nobody gave an inch. Tempers flared. Gary Kipfmiller staked out a corner no one dared invade. Except for Benning, then a rock solid 205 pounds, who made the passive Kipfmiller, tipping the scales at 350-plus, a special project. “I rode him unmercifully,” said Benning. “He’d whine like a baby and I’d go, ‘Then do something about i!.” Benning said he sometimes feared that in a fit of anger Kipfmiller would drop all his weight on him and crush him. Washington and Hospodka went at it with ferocity. Any bad blood was left in the room. “As we were a team on the mat, off the mat we watched out for each other. Even though we were at each other’s throats on the wrestling mat, whatever happened on the outside, we were there. If somebody needed something, we were there,” said Paul Martinez, who grew up with his brother Tony, the team’s student trainer-manager, in the South O projects. The competition and camaraderie helped heal psychological wounds Paul carried from Vietnam, where he was an Army infantry platoon leader. An emotional Martinez told Benning at a mini-reunion in January, “You were like a platoon leader for us — you guided us and protected us. Coming from a broken family, I not only looked at you as a coach but as a father.” Benning’s eyes moistened. Joining them there were other integral members of UNO’s 1970 NAIA championship team, including Washington and Hospodka. The squad capped a perfect 14-0 dual season by winning the tough Rocky Mountain Athletic Conference tournament in Gunnison, Colo. and the nationals in Superior, Wis. It was the first national championship won by a scholarship team at the school and the first in any major sport by a Nebraska college or university. Another milestone was that Benning became the first black coach to win an integrated national championship in wrestling and one of the first to do so in any sport at any level. He earned NAIA national coach of the year honors in 1969. University of Washington scholar John C. Walter devotes a chapter to Benning’s historymaker legacy in a soon-to-be-published book, Better Than the Best. Walter said Benning’s “career and situation was a unique one” The mere fact Benning got the opportunity he did, said Walter, “was extraordinary,” not to mention that the mostly white student-athletes he taught and coached accepted him without incident. Somewhere else, he said, things might have been different. Walter said it was the coach’s discipline and determination to achieve against all odds that prepared him to succeed. Benning’s legacy can only be fully appreciated in the context of the time and place in which he and his student-athletes competed. For example, he was set to leave his hometown after being denied a teaching post with the Omaha Public Schools, part of endemic exclusionary practices here that restricted blacks from obtaining certain jobs and living in many neighborhoods. He only stayed when Bail chose him to break the color line, though they never talked about it in those terms. In assuming the burden of being the first, Benning took the flak that came with it. Washington said though Benning hid what he had to contend with, some of it was blatant, such as snubs or slights on and off the mat. His white wrestlers recall many instances on the road when they or the team’s white trainer or equipment manager would be addressed as “coach” or be given the bill at a restaurant when it should have been obvious the well-dressed, no-nonsense Benning was in charge. “He did it in a quiet way. He always thought his character and actions would speak for him. He went about his business in a dignified way,” said Hospodka. UNO wrestlers didn’t escape ugliness. At the 1971 nationals in Boone, N.C., Washington was the object of a hate crime — an effigy hung in the stands. Its intended effect backfired. Said Washington, “That didn’t bother me. You know why? I was used to it. That just made me want to go out there more and really show ’em up.” He did, too. At least not a black authority figure with a group of white men answering to him. The worst scene came at the Naval Academy, where the cold reception UNO got while holed up three days there was nothing compared to the boos, hisses, catcalls and pennies hurled at them during the dual. In a wild display of unsportsmanlike conduct Benning said thousands of Midshipmen left the stands to surround the mat for the crucial final match, which Kipfmiller won by decision to give UNO a tie. The white wrestling infrastructure also went out of its way to make Benning and his team unwelcome. He said the committee chairman exhibited outright disdain for him. Benning believes the ’71 championship site was awarded to Boone rather than Omaha, where the nationals were a big success, as a way to put him in his place. “The committee came up with Appalachian State, which just started wrestling. I swear to this day the only reason that happened was because of me and my team,” he said. He and his wrestlers believe officials had it in for them. “There was one national tournament where there’s no question we just flat out got cheated,” said Benning. “It was criminal. I’m talking about the difference between winning the whole thing and second.” Refs’ judgements at the ’69 tourney in Omaha cost UNO vital points. “It was really hard to take,” said Benning. UNO had three individual champs to zero for Adams State, but came up short, 98-84. One or two disputed calls swung the balance. 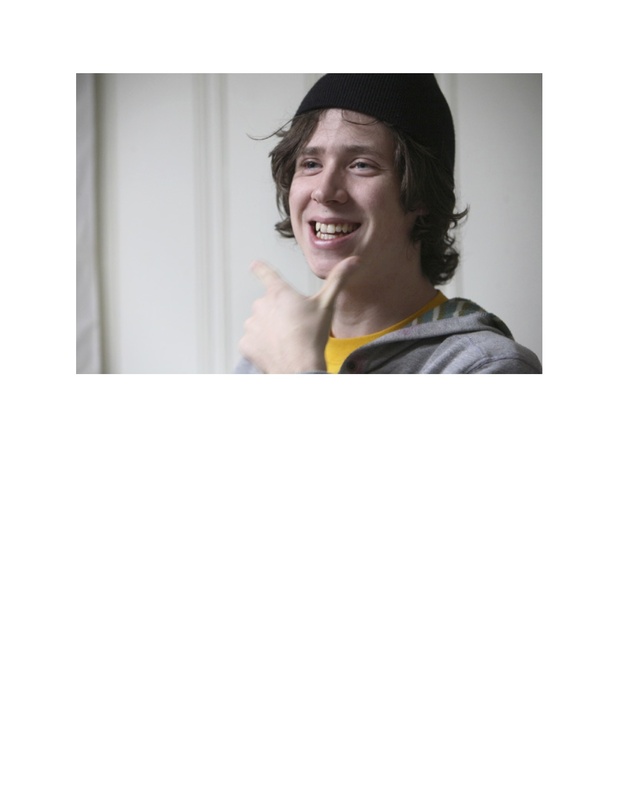 Despite all the obstacles, Benning and his “kids” succeeded in putting UNO on the map. The small, white institution best known for its Bootstrapper program went from obscurity to prominence by making athletics the vehicle for social action. In a decade defined by what Benning termed “a social revolution,” the placid campus was the last place to expect a historic color line being broken. The UNO program came of age with its dynamic black coach and mixed team when African-American unrest flared into riots across the country, including Omaha. A north side riot occurred that championship season. UNO’s black wrestlers, who could not find accommodations near the UNO campus, lived in the epicenter of the storm. Black Panthers were neighbors. Mel Washington, his brother Dhafir and other teammates watched North 24th St. burn. Though sympathetic to the outrage, they navigated a delicate line to steer clear of trouble but still prove their blackness. A uniformed police cadet then, Washington said he was threatened once by the Panthers, who called him “a pig” and set off a cherry bomb outside the apartment he shared with his wife and daughter. Benning, too, found himself walking a tightrope of “too black or not black enough.” After black U.S. Olympians raised gloved fists in protest of the national anthem, UNO’s black wrestlers wanted to follow suit. Benning considered it, but balked. In ’69 Roy Washington converted to Islam. He told Benning his allegiance to Black Muslim leader Honorable Elijah Muhammad superseded any team allegiance. Benning released him from the squad. Roy’s brother Mel earlier rejected the separatist dogma the Black Muslims preached. Their differences caused no riff. Dhafir (Roy) rejoined the team in December after agreeing to abide by the rules. He won the 150-pound title en route to UNO capturing the team title over Adams, 86-58. Hospodka said Dharfir still expressed his beliefs, but with “no animosity, just pride that black-is-beautiful. Dharfir’s finals opponent, James Tannehill, was a black man married to a white woman. Hospodka said it was all the reason Dharfir needed to tell Tannehill, “God told me to punish you.” He delivered good on his vow. It was also an era when UNO carried the “West Dodge High” label. Its academic and athletic facilities left much to be desired. “The university didn’t have that many things to feel proud of,” said Benning. Wrestling’s success lifted a campus suffering an inferiority complex to the University of Nebraska-Lincoln. Wrestling was one area where UNO could best NU, whose NCAA wrestling program paled by comparison. Benning said, “It was more important we had the best wrestling team in the state than winning the national championship. Everybody took pride in being No. 1.” Anderson said small schools like UNO “could compete more evenly” then with big schools in non-revenue producing sports like wrestling, which weren’t fully funded. He said as UNO “wrestled and defeated ‘name’ schools it added luster to the team’s mystique. NU was among the NCAA schools UNO beat during Benning’s tenure, along with Wyoming, Arizona, Wisconsin, Kansas and Cornell. UNO tied a strong Navy team at the Naval Academy in what Hospodka called “the most hostile environment I ever wrestled in.” UNO crowned the most champions at the Iowa Invitational, where if team points had been kept UNO would have outdistanced the big school field. “We didn’t care who you were — if you were Division I or NAIA or NCAA, it just didn’t matter to us,” said Hospodka, who pinned his way to the 190-pound title in 1970. The confidence to go head-to-head with anybody was something Benning looked for in his wrestlers and constantly reinforced. The sport’s bible, Amateur Wrestling News, proclaimed UNO one of the best teams in the nation, regardless of division. UNO’s five-years of dominance, resulting in one national championship, two runner-up finishes, a third-place finish and an eighth place showing, regularly made the front page of the Omaha World-Herald sports section. The grapplers also wrestled with an aggression and a flair that made for crowd-pleasing action. Benning said his guys were “exceptional on their feet and exceptional pinners.” It wasn’t unusual for UNO to record four or five falls per dual. Washington said it was UNO’s version of “showtime.” He and his teammates competed against each other for the most stylish or quickest pin. Hospodka said “the bitter disappointment” of the team title being snatched away in ’69 fueled UNO’s championship run the next season, when UNO won its 14 duals by an average score of 32-6. It works out to taking 8 of every 10 matches. UNO posted three shut outs and allowed single digits in seven other duals. No one scored more than 14 points on them all year. The team won every tournament it competed in. Muhammad won his third individual national title and Hospodka his only one. Five Mavs earned All-America status. This band of brothers is well represented in the Maverick Wrestling and UNO Halls of Fame. The championship team was inducted by UNO and by the Rocky Mountain Athletic Conference. Benning, Mel Washington, Dhafir Muhammad and Curlee Alexander are in the Nebraska Black Sports Hall of Fame. But when UNO went from NAIA to NCAA Division II in ’73 it seemed the athletic department didn’t value the past. Tony Martinez said he rescued the team’s numerous plaques and trophies from a campus dumpster. Years later he reluctantly returned them to the school, where some can be viewed in the Sapp Fieldhouse lobby. UNO’s current Hall of Fame coach, Mike Denney, knows the program owes much to what Benning and his wrestlers did. The two go way back. Benning left coaching in ’71 for an educational administration career with OPS. Mike Palmisano inherited the program for eight years, but it regressed.